Bali traditional house is a reflection of the Balinese custom which is thick with the values of Hinduism. The variety of the uniqueness and characteristic of the architectural side or the philosophical aspect that has been embodied in it makes the traditional Balinese house is very interesting. Balinese traditional house is identical with a temple that we called by “Gapura Candi Bentar”. Gapura Candi Bentar is a gate consists of two temple buildings that have identical shapes and are placed parallel as the main gate to enter the courtyard area of the house or the outermost gate. Usually, its uses as the main entrance of the temple or place of Hindu worship in Bali. Despite having identical shapes with parallel positions, these gates are placed separately from one to another with no cover on the roof. Although it does not have a roof, this gate is still connected to each other with the presence of an iron fence and a number of stairs on the bottom. In addition to the temple, around the gate, there are usually various statues as a symbol of Balinese cultural customs. This building also has a gate of split gate, because the building forms as if describing a temple building that split into two. To build a home, Balinese people use a rule we called “Asta Kosala Kosali”. Asta Kosala Kosali is a Fengshui of Bali, is an ordinance, layout, and building arrangement for residential buildings and holy place buildings in Bali in accordance with philosophical, ethical, and ritual base with respect to the conception of manifestation, good days (adults) to build a house, and the implementation of Yadnya. The philosophy contained in Asta Kosala Kosali is the awakening of harmony and dynamism in life when achieved a peaceful and harmonious relationship between three aspects or Tri Hita Karana. Aspects that include Tri Hita Kirana are Pawongan (a harmonious relationship between human and human), Palemahan (a harmonious relationship between human and environment) and Parahyangan (spiritual or Harmonious Relationship between human and The God). Asta Kosala Kosali became the main benchmark of the corner and direction of the building inside the traditional house of Bali. The north-east angle is a sacred area or a good area so the temple is placed at this angle, while the south-western corner is considered lower or the bad area so that the kitchen position is placed at this angle. 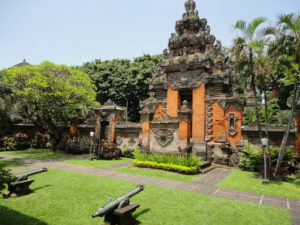 In addition to the layout and the construction of the building on the traditional house of Bali is also based on the concept of Hindu religion called Tri Angga. Tri Angga is a hierarchy or tier consisting of Nista, Madya, and Utama. Nista reflects the lowest hierarchy of a level shown through the foundation of the building or the foundation of the building as the support of the building above it. The material is made of brick or stone mounted neatly arranged in accordance with the dimensions of space to be built. Nista also reflects the underworld, nature of demons or lust. Madya reflects the center of the building shown in the form of walls, windows, and doors. Madya also reflects the strata of man or human nature. While the Main reflects the symbol of the upper building shown in the form of the roof of the house, they believe that the upper part is the most sacred place in the house and is described as the dwelling place of their ancestral deity or deity. The material used in Balinese traditional house is the roof of fibers and reeds. In generally Balinese buildings will be separated due to following the concept. Finally, the home for one family is in one area but separately, separate small buildings are merged only with the fence that surrounds them. Separate buildings within each area of the traditional Balinese house consist of houses, temples (holy shrines of Hindus), Banjars (meeting hall), and others. With these concepts, traditional Balinese architecture is defined as the layout of Balinese life containers that have been preserved from generation to generation with all the rules that prioritize harmony. These Balinese traditional architectural forms are recorded in the palm of Asta Kosala-Kosali, Asta Patali, and others. Until the development began there are adjustments made by the undagi to keep up with the times, but still use the rules of Tri Hita Karana that has been taught since antiquity. If you observe Balinese homes when visiting there, you will surely find its uniqueness. The average house of Bali will have a very characteristic interior design. There are knick-knacks that adorn the walls or doors, there are also carvings colored in contrast to the walls of the house. Every ornament that adorns the Balinese customs house is an expression of gratitude to the Creator of the Universe. Traditional Balinese house spatial follows the cosmological conception in the arrangement of the yard. The layout of building masses positioned according to function, meaning, and its value. The house is considered a microcosm of the universe that symbolizes the territory, orientation, layout, and hierarchy of spaces.